LOS BANOS – Filipino swimmers set six new national junior records and improved on their previous performance as the 42nd Southeast Asia Age Group Swimming Championships wound up at the Trace Aquatics Center here on Sunday. The most outstanding mark was set by Filipino-American double silver medalist Jonathan Cook, who sank the 12-year-old Gerard Bordado’s 100-meter breaststroke mark of 1:05.47 in clinching the silver here in a time of 1:03.58 in the meet supported by the Philippine Sports Commission, Finis Philippines and Boysen Paints. Another was from Arbeen Miguel Thrulen, whose bronze-medal time of 27.75 seconds in the boys 13-under butterfly stroke event erased the 11-year-old mark of 28.17 seconds of Gabriel Castelo in the three-day age group swimfest organized by the Philippine Swimming Inc, which is both recognized by the International Swimming Federation and Asia Swimming Federation. A third significant mark was set by Liaa Margarette Amoguis, who captured a bronze medal in the girls 13-under 400-meter 400-meter individual medley in 5:19.62, lopping nearly seven minutes off the previous mark of 5:26.26 booked by Raven Faith Alcoseba three years ago. Other new records set were from Rafael Barreto in the 16-18 boys 50-meter butterfly (25.54) and Juan Marco Daos in the boys 13-under boys 200-meter freestyle (2:05.96) and Mishka Sy in the girls 13-under 200-meter backstroke event (2:27.34) in the tournament also backed by Bellevue Hotel, the official Hotel, and Summit Mineral Water. Adding to the country’s medal tally were Xiandi Chua, Kirsten Robyn Tan and Lady Samantha Corpuz, who won a bronze medal each to wind up the Philippine campaign with a total of four gold, seven silver and 15 bronze medals, surpassing the 4-9-8 tally of the country in Brunei last year. Competing in her fifth and final event, Chua booked a personal best time of 58.75 seconds in placing third in the girls 16-18-year-old 100-meter freestyle race behind Vietnamese champion Nguyen Diep Tram Tram (57.75) and Indon silver medalist Adinda Larassati Dewi (58.02). Together with the two golds, one silver and relay bronze she won earlier, the lithe and soft-spoken swimmer emerged as the country’s most bemedalled athlete in the championships also supported by Enoc Lubricants, Wilcon Depot and Arena Phils. 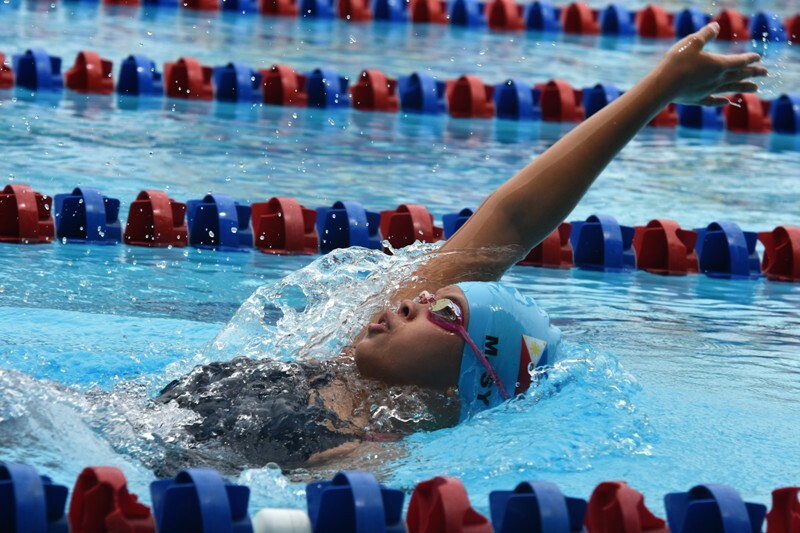 Tan, who won her first medal in her second outing the age-group swimfest in bagging bronze in the girls 13-under freestyle (1:02.41) while Thailand’s Napatsawan Jaritkla (1:00.40) and Vietnam’s Pham Thi Van (1:01.9) took the gold and silver, respectively. “I am happy I was able to win my first medal and contribute to the medal tally of our country,” said the bespectacled Tan, a La Salle Zobel Grade 8 Student, of her modest achievement in the age group showcase also backed by Club 30 Golf Plus, Orocan Phils. Tajima Phils, Twin Oaks Sucere Corp and Vics Contstruction Supply. Corpuz garnered the last medal for the hosts with a bronze in the grueling girls 13-under 800-meter freestyle (9:44.48) ruled by Thailand’s Kamone Kammuang (9:04.04). PSI president Lani Velasco praised American coach Sam Busch for training the PH junior tankers intensively for five weeks, resulting in many national junior marks broken and improved times from majority of them.